LIGONIER, PA – March 12, 2014 – The Fred Rogers Company (www.fredrogers.org) and Idlewild and SoakZone (www.idlewild.com) today announce that they are teaming together to bring the popular childrens’ character, Daniel Tiger, to the Ligonier amusement park, which was named ‘Best Kids’ Park in the World” for the fourth consecutive year. The main character from the award-winning animated preschool series Daniel Tiger’s Neighborhood on PBS KIDS, Daniel Tiger will appear at the park daily during the 2014 summer season. The two companies previously partnered in 1989, developing a life-size trolley ride that took visitors to the “Neighborhood of Make-Believe.” The trolley ride concluded its 25-year operation at the end of the 2013 season. In 2014, this area will serve as the location for daily Daniel Tiger “Meet and Greets” and photo opportunities. A new Daniel Tiger’s Neighborhood-themed attraction is being planned for 2015 at this same location, along with a new, live-action show featuring Daniel Tiger and other characters from Daniel Tiger’s Neighborhood. Idlewild & SoakZone will open for its 137th operating season on May 22. ABOUT THE FRED ROGERS COMPANY - The company was founded by Fred Rogers in 1971 as the non-profit producer of Mister Rogers’ Neighborhood for PBS. In the years that followed, it not only created hundreds of episodes of this much -loved program, but also extended Fred’s values and approach to other efforts in promoting children’s social, emotional and behavior al health and supporting parents, caregivers, teachers and other professionals in their work with children. The Fred Rogers Company continues to build on Fred’s legacy in innovative ways through a wide variety of media, and engaging new generations of child ren and families with his timeless wisdom. For more information, visit us at www.fredrogers.org. ABOUT IDLEWILD & SOAKZONE - Founded in 1878 as a picnic ground along the Ligonier Valley Rail Road, Idlewild & SoakZone (www.idlewild.com) is the oldest amusement park in Pennsylvania and third-oldest in America. Idlewild is recognized as the world’s best amusement park for children per Amusement Today magazine (http://www.amusementtoday.com). Featuring seven theme areas, Idlewild is part of the Palace Entertainment family of parks, which owns and operates over 40 theme parks, water parks and family entertainment centers nationwide, including Kennywood and Sandcastle. Palace entertains millions of guests annually and is one of the largest park operators in the nation. 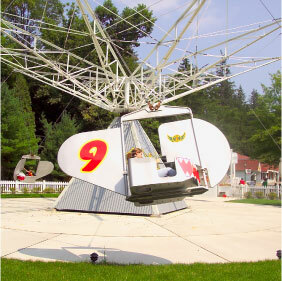 For more information, call 724.238.3666 or visit http://www.idlewild.com and http://www.palaceentertainment.com.